Creation: Appeared March 1949 (CTB) as new primary routing, running as it does now, plus a few additional streets for a total of 1.65 miles. This is the only VA 358. Adjustments: In Aug 1967 (CTB), two segments were removed from the primary system totaling 0.093 miles: Administration Circle off 1st St and the driveway from 1st St to Conference Hall. In Aug 1969 (CTB), two more segments were removed from VA 358 totaling 0.43 miles: 3rd St from 1st St to the Watch Makers School and Disposal Plant Rd northwest off 1st St. Posting: Full shields at US 250; shields and white rectangles within the facility. Other names: Wilson St, 1st Ave, 1st St and 4th St where they run on state property. 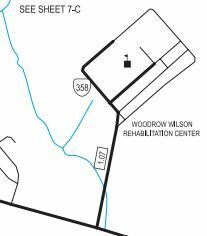 Comment: VA 358 does not appear on official maps although there is room. 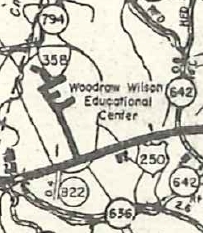 VA 358 is erroneously identified as VA 357 in the 1949 Route Log. 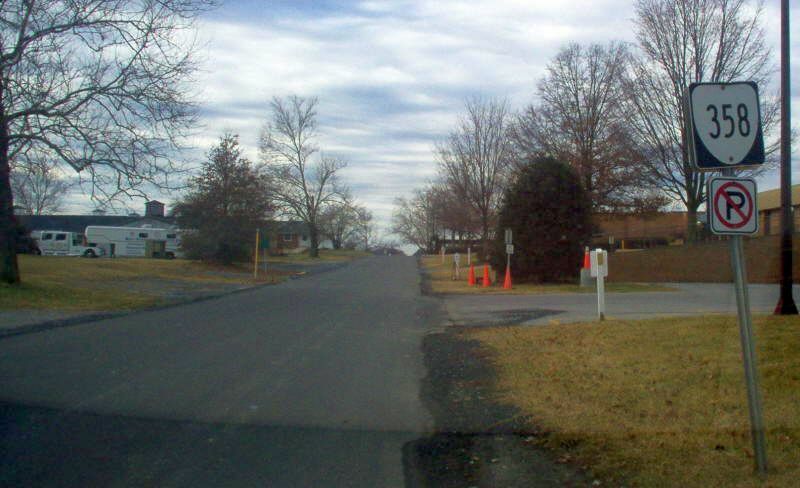 A new road was built from the US 250/VA 358 intersection southeast to VA 285 near I-64, but this road was designated SR 636.